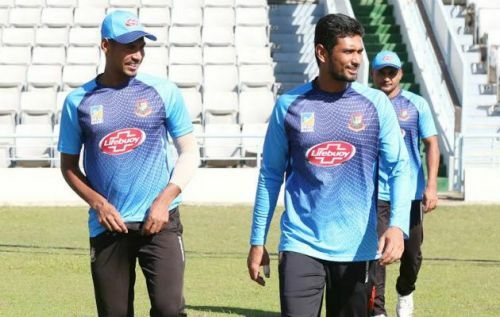 After registering a comprehensive one-day series win over Zimbabwe, Bangladesh interim captain Mahmudullah said that their principal goal is to translate their one-day prowess into Tests as well against the same opponents. The first contest of the two-match Test series will take place from 3 November in Sylhet and the second and final Test will be held in Dhaka from 11 November. "Tests are different from one-dayers. Since we have won the one-day series, all of us are confident to bring those performances in Tests too. As an opponent, we should respect Zimbabwe. They are a pretty good team. They played good cricket although we won the one-dayers," Mahmudullah said on the day before the Test series begins. "Test is a format where you have to face new challenges in every session of the game. It is essential to understand that and perform accordingly. We have to do many small tasks with great care every day," Mahmudullah added. Bangladesh are set to play this series without the services of Shakib Al Hasan and Tamim Iqbal. Both have been ruled out due to injuries. While Shakib is recovering from a nasty finger injury, Tamim is rehabbing a broken wrist. Mahmudullah admitted that Bangladesh will suffer from the absence of the star duo. Bangladesh's captain for the series said: "They always help the team balance. Since we are not getting the services of Shakib, we have to play an extra bowler and batsman which is rather tough. "On the other hand, the absence of Shakib and Tamim offers a big chance for the newbies. We have to show how eager we are to perform and how keen we are to take the challenges. I think everyone is waiting to perform in the forthcoming series." Bangladesh have played 14 Tests in total against the African nation, registering five wins and six losses. Mahmudullah also said that they are looking at nothing but a win in the first-ever Test in Sylhet: "Sylhet is a wonderful venue, of course. We are looking forward to making its debut in Test cricket memorable with a win."